Juanpi, celebrating a spectacular goal against Argentina, has earned a recall (Marca). This curious encounter between two nations whose relationship has long raised eyebrows in the White House sees Venezuela coach Rafael Dudamel hoping to capitalise on the strides made in the second half of 2017. Perhaps in part due to its timing – announced less than three weeks ago, just after a qualification cycle had ended and over 18 months before the next competitive match – Venezuelan media coverage of this friendly has been almost non-existent. That it is taking place in the Netherlands may also be a factor: Arnhem was originally scheduled to be the host city, but the match has since been moved to Nijmegen, where it will be played behind closed doors at the home of the local second-tier side. For this single game, Dudamel has called up a reduced 20-man squad. Following on from the relative success he has overseen in the final four World Cup qualifiers played over September and October – three draws and a win – he has selected seven players who were Under-20 World Cup runners-up back in June. Many of these players have already made important senior contributions and this squad provides an opportunity for highly-touted attacker Adalberto Peñaranda (Málaga, on loan from Watford) to be reintegrated with the fold, injury having ruled him out of previous call-ups. With Dudamel now signed up for the long run, there should be many more call-ups for these individuals as well as other members of this silver generation, not least Sergio Córdova (Augsburg), who has featured regularly for the seniors but is currently sidelined, having picked up a knock last month in the win against Paraguay. Otherwise, though Dudamel’s intentions have not been elaborated upon in great detail, it is apparent that he wishes to try out a few new things. Indeed, though this selection includes many familiar faces from recent games, notably absent are captain Tomás Rincón (Torino, on loan from Juventus), MLS hotshot Josef Martínez (Atlanta United) and Rómulo Otero (Atlético Mineiro). All three men are likely to play crucial roles in the assault on Qatar 2022, but one man who may profit from their strategic omissions is versatile midfielder Juanpi (Málaga). His exclusion from last month’s monster 31-man squad was a surprise, yet though the door has not re-opened for club team-mate Roberto Rosales, many will be hoping that this 23-year-old will be able to re-assert himself as a key player for the future. Whilst a deep-lying position is possible, a more attacking role is likelier. Iran, who have been led to their second consecutive World Cup by Carlos Queiroz, will certainly pose a test. 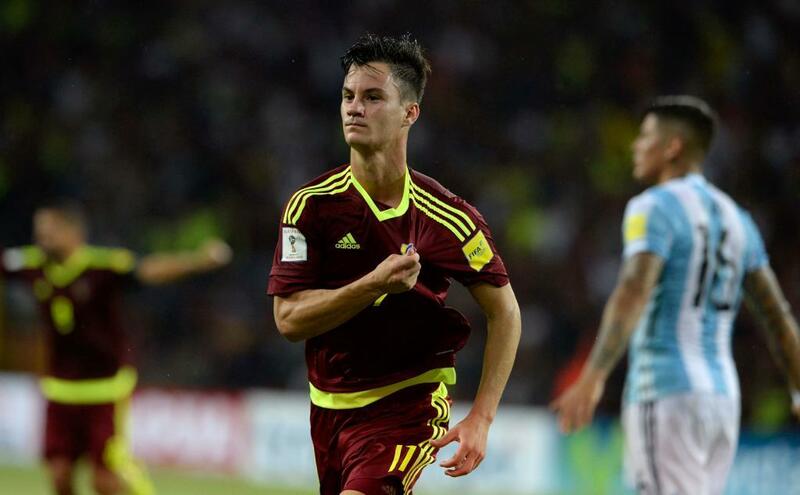 They beat La Vinotinto 1-0 in the two nations’ solitary previous encounter some 15 years ago and come into the game having defeated fellow Russia 2018 qualifiers Panama on Thursday. In this game – also played on European soil – the Central Americans’ goal was netted by one Gabriel Torres, a striker who has enjoyed two high-scoring spells at Venezuelan side Zamora FC. Though there won’t be much of an atmosphere at this upcoming clash and it seems unlikely to attract much of an audience back home, Dudamel has long set his sights on Qatar 2022 and will seek to make the most of every opportunity that can help his side make progress. Of course extending the seniors’ six-match unbeaten streak would be great, but more players adapting well to his system, irrespective of the result, will surely be of overriding importance in Nijmegen. Wilker Ángel (Terek Grozny, Russia), Jhon Chancellor (Delfín, Ecuador), Víctor García (Vitória Guimarães, Portugal), José Hernández (Caracas FC), Ronald Hernández (Stabæk, Norway), Rubert Quijada (Al Gharafa, Qatar, on loan from Caracas FC) & Mikel Villanueva (Cádiz, on loan from Málaga, Spain). Juan Pablo “Juanpi” Añor (Málaga, Spain), Arquímedes Figuera (Universitario, Peru), Yangel Herrera (New York City FC, USA, on loan from Manchester City, England), Ronaldo Lucena (Atlético Nacional, Colombia), Darwin Machís (Granada, Spain), Jhon Murillo (Kasımpaşa S.K., Turkey, on loan from Benfica, Portugal), Adalberto Peñaranda (Málaga, Spain, on loan from Watford, England), Aristóteles Romero (Crotone, Italy) & Yeferson Soteldo (Huachipato, Chile). Anthony Blondell (Monagas S.C.) & Salomón Rondón (West Bromwich Albion, England). This entry was posted in Venezuela National Team and tagged Adalberto Peñaranda, International Friendly, Iran, Juanpi, La Vinotinto, Rafael Dudamel, Venezuela, Venezuela National Team, Wuilker Fariñez on November 12, 2017 by hispanospherical.